The column is defined as bit on a SQL Server table. You created an SSIS package to export the table to a text file. In Mgt Studio when you query the table, the bit column displays 1 and 0 as its value, but in the output text file they are true and false. But it is still the same. The output is still true/false not 1/0 as you see in Mgt Studio. You hoped that it will now be 1 and 0, but alas no. It is still true and false. So you changed the data type in the text file connection from string to four byte signed integer. What you get is -1 for true and 0 for false. Yes! Not 1 and 0 but -1 and 0. So you changed the data type in the text file connection to four byte unsigned integer. Ha this will force it to be 1 and 0 you thought. Go to OLE DB Source Output, Output Column (NOT External Columns! ), then select the bit column. Change the DataType from Boolean to Four Byte Signed Integer. Note: If you don’t the above the output will be -1 and 0, not 1 and 0. And execute the data flow. Voila, you get 1 and 0 in the output text file. Note: whether in the flat file connection you defined the output columns as boolean or string or signed int, it will still be 1 and 0. Hope it helps. As usual I welcome comments and corrections. These booleans were giving me trouble till i read your post. Your solution works like a charm. This solution works perfectly while creating packages using BIDS. But how about data transfer between tables and/or Servers using Import Export Wizard in Management Studio? I am facing similar issue using the wizard, but unable to find an appropriate solution. Any help would be appreciated. I’m using SQL Server 2012 Developer Ed. 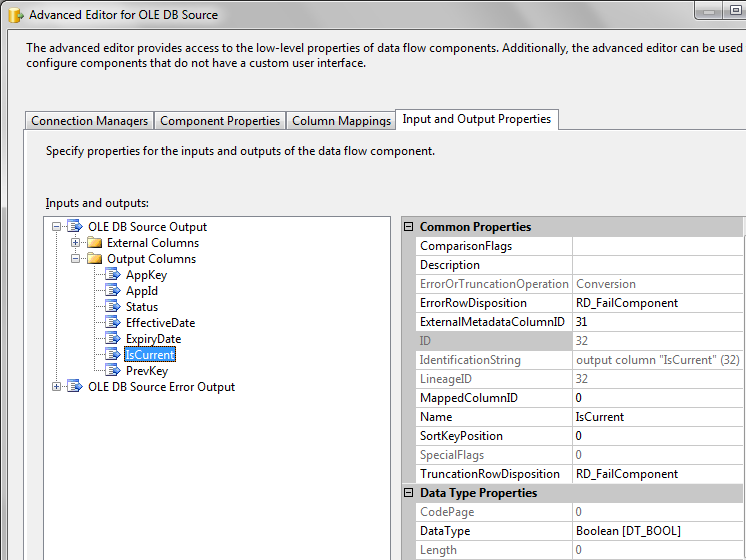 If your issue happens on 2008/R2, try this: on step 7 Save as SSIS package. Then modify the package as per my article before running it. However, the best way to deal with this is to… let the connection managers and components work as they have been designed to work. That means no conversions throughout. If you use the right data types, you won’t have problems. That is, you export a BIT field to a file as DT_BOOL and you import into a SQL table as DT_BOOL – as simple as that. If the destination table has a BIT field, it’ll understand that ‘True’ means 1 and ‘False’ means 0. No stunts necessary. Try it.